Bits of My Own: Bountiful Blueberries is finished! This was indeed a quick stitch. It measures about 2" X 2-5/8" on 32ct. It was completed in less than 3 evenings. I needed a quick little one after all of my big projects! 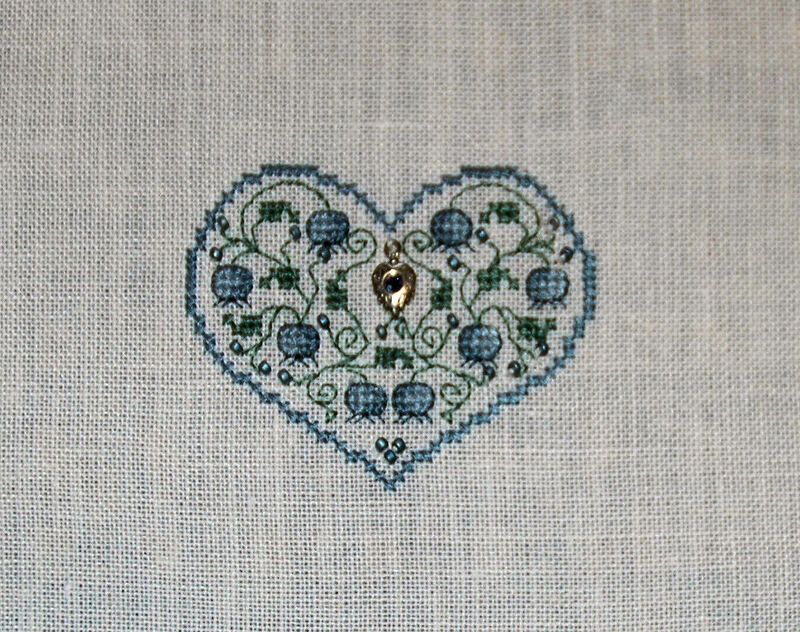 I outlined the blueberries, sewed on all the beads and the charm, and Voila! Now of course, I have to find a frame for it. Lately I have been spending my time working on my family tree. I put in a good deal of work back in the 80's, but I have found a little bit more with the help of the internet. I still need some major breaks though to trace my ancestors across the ocean. I have a Mary Clark in my family, and I thought it would be fun to do the Mary Clark Sampler. 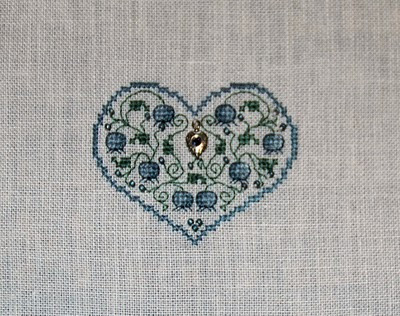 Of course my relative is no relation to the Mary Clark who originally stitched this, but I really like the sampler anyway, so it seemed destined to be my next project. I am stitching it on 40ct linen that I coffee-stained. I decided to use silk thread on this one. Hope my eyes hold out on that 40ct! It's slow going! Bountiful Blueberries is so cute!! And The Mary Clark sampler looks like fun!!! Can't wait to see more progress!! Love Bountiful Blueberries!! I stitched the Mary Norwood Sampler for my Aunt Mary Norwood several years ago...was so excited to find the chart with her name on it. Enjoy stitching the sampler bearing your ancestors name! Two finishes in such a short time, wow. Congratulations!